TAUNTON, Mass. 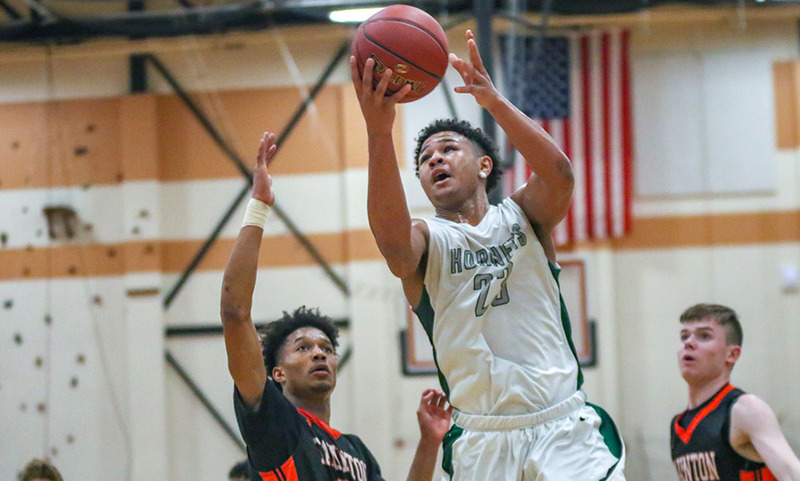 – For the first 16 minutes of the 2019 Division 1 South Sectional Final, the second-seeded Mansfield Hornets couldn’t seem to do anything right. Meanwhile, the fifth-seeded Tigers of Newton North played about as good as they could have hoped, combining eight made three-pointers with 14 Hornet turnovers for a 40-24 lead at halftime. But there was no quit in the Hornets. Mansfield dominated the third quarter, making it a two-point contest — anyone’s game — with eight minutes left to go in the game. The Tigers stood tall, though, never surrendering the lead and coming up with answer after answer to come away with a 74-64 victory, claiming the program’s first sectional title since 2006. “I thought we did a good job disrupting them and taking stuff away,” said Newton North coach Paul Connolly. “We knew they’d have a run, and they had a huge run and came right at us. We responded, we made baskets when we needed them. We regained our poise (at the end). Mansfield looked like a completely different team in the third quarter, ramping up the aggressiveness and attacking the basket with a purpose. And on the defensive end, the Hornets played with a renewed sense of purpose that limited the Tigers to just seven points in the eight-minute stretch. The surge mostly came over the final three minutes of the third. The defense limited Newton North to just three points over the first five minutes, but the Hornets were still trailing by double-digits, 45-34, with under three to go. Sophomore Matt Boen (13 points, eight rebounds, five assists) hit a three-pointer and Damani Scott (17 points, six rebounds) came up with a steal that led to two free throws. The Hornets sandwiched a pair of stops around a free throw from Jack Mousette, and then junior Sam Stevens (14 points, four rebounds) drained a triple to make it a three-point game, down 46-43 with just under a minute to go. Newton North added a free throw but Tommy Dooling (10 points) finished a contested layup at the buzzer to bring the Hornets — once down 19 points in the first half — within two, 47-45, entering the final quarter. Unfortunately, the momentum didn’t carry over right away in the fourth quarter. The Hornets reverted to the bad habits of the first half, mainly turnovers. Mansfield committed four turnovers in the opening two and a half minutes of the fourth quarter. After Newton North’s Kyle Ray-Canada (28 points) opened the quarter with the three, Mansfield missed a three and then was whistled for back-to-back offensive fouls after getting stops. Khalil Lofton came up with a steal for an easy layup for the Tigers, the Hornets missed a triple, and Ray-Canada finished at the rim to cap a quick 7-0 spurt that gave Newton North breathing room up 54-45. The Hornets once again made a push to get back in it. Dooling sank two free throws, Drew Rooney added another, and Boen, playing with an injured wrist, used a nice fake and lay-in for two to make it 56-52 with just over three minutes to go. But Canada-Ray earned a trip to the line for two on back-to-back possessions, the Hornets had another turnover, and Lofton sank two more free throws to push the lead to 62-52 with two minutes left. Newton North had a terrific fourth quarter, taking advantage of some forced and some uncharacteristic Hornet turnovers. Mansfield gave the ball away nine times, and the Tigers hit nine field goals, include three from three-point range to race out to a 21-9 lead through eight minutes. The Tigers’ three-point shooting only improved in the second quarter. Newton North connected on five more triples, including one from Ray-Canada with under a minute to go to push the lead to 40-21. Boen gave Mansfield some life with a late three and block on the final shot to make it 40-24 at halftime. “I thought us playing from behind could create some nerves,” Vaughan said. “In the third quarter, we took the pressure off of thinking and just let them go out and play. I think it made the game so much easier for them, and you can only do that for so long and for so often. We almost were just kind of trying to play pick up and let the game freely go. Mansfield boys basketball finishes the season at 22-5. #4 Franklin, 60 vs. #5 Algonquin, 63 – Final – Click here for a Recap and Photo Gallery from this game. #10 Xaverian, 62 @ #2 Mansfield, 77 – Final – The Hornets hit on all cylinders to begin the game, pouring in 29 first quarter points to take a commanding lead that they never relinquished. Mansfield hit five three-pointers in the first with Damani Scott (15 points) and Tommy Dooling (20 points) each hitting a pair and sophomore Matt Boen (11 points) adding another. TJ Guy (11 points) and Khristian Conner (eight points) each added five points in the opening quarter while junior Sam Stevens added nine points in the game. The Hornets led 49-25 at halftime and took a 61-46 lead into the final quarter. #16 Notre Dame Academy, 56 @ #1 Foxboro, 58 – Final – Shakirah Ketant scored 16 points and Katelyn Mollica added 15 for the Warriors, who held off the Cougars to reach the D2 South quarterfinal. MANSFIELD, Mass. – The game seemed over in the third quarter. Mansfield had found another gear defensively and used an 18-0 run either side of halftime to take control against BC High in Tuesday night’s Div. 1 South first round game in the Albertini Gym. It is not often that the Hornets let what grew to as much as a 18-point lead slip, but the Eagles are not a typical No.15 seed and they came storming back. The lead was down to single digits by the end of the third quarter and only four points early in the fourth. Each time, Mansfield found a response to keep the Eagles at bay, but with only a 1:34 left the lead was just five, and with 34.8 on the clock it was down to just two. While the Hornets are the defending state champions and come into the tournament as the No. 2 seed, there is still a learning curve for a number of players who are seeing their first significant tournament action. As it turned out, the Hornets had just enough to get the win. Tommy Dooling got into the lane and dropped a pass off to T.J. Guy for the layup with just seconds left that put Mansfield back up four and that was how it would finish, a 57-53 win that could also serve a message about having to finish off an opponent when on top. When these two teams met back in December, Mansfield won by 22 points, but the Eagles were without 6-foot-8 junior center Ozzy Trapilo. The Eagles were without him for large portions of the first half on Tuesday as well because the Hornets went right at the big man from the start and got him into early foul trouble (three fouls in the opening five minutes). Guy (14 points) took the ball into the body of the BC High center and earned a three-point play for Mansfield’s first basket. 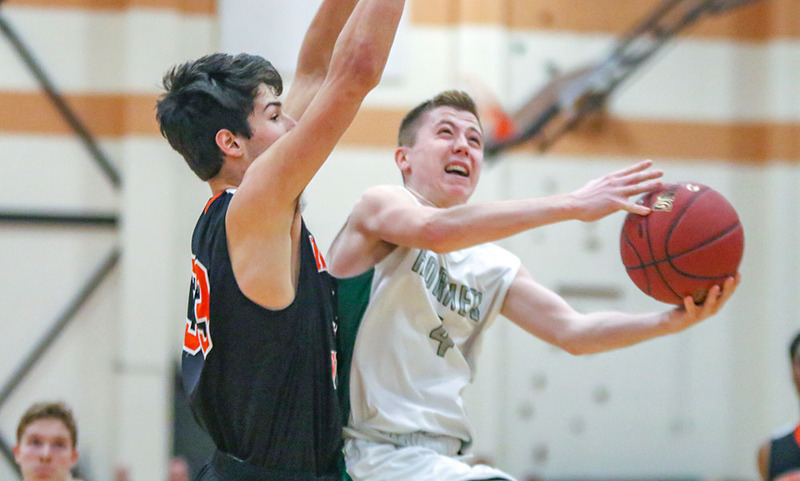 Sam Stevens (11 points) added a three-point play on an offensive rebound and Dooling (13 points) twice got to the rim, but the Hornets allowed eight points to Noah Rothhaar and were tied 12-12 after one. The game stayed tight in the second and the Eagles took a 20-19 lead following a jumper by Kevin Keenan. BC High wouldn’t score again until midway through the third quarter. Mansfield closed the half on an 8-0 run. Stevens put the Hornets back in front with layup off a Damani Scott assist, Dooling drilled a three off a Matty Boen assist, and then Scott got to the rim on a drive to make it 27-20 at the break. Mansfield kept its foot on the gas in the third quarter. Scott (game-high 15 points) got the crowd fired up with a steal and two-hand slam and that was followed by Guy picking off a pass and finishing with the first dunk of his career. After a pull-up three by Boen, it was suddenly 40-22 and the game was on the verge of getting out of hand. It was on the verge but the Eagles made sure that it never fully got away. 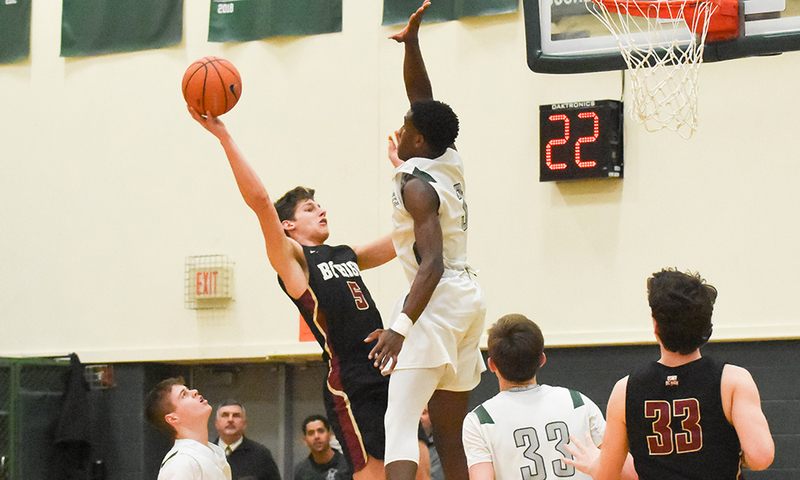 BC High answered Mansfield’s 21-2 run with a 14-3 run of its own, capped by Mike Loughnane’s third three of the night, and the Eagles got the lead back down to just seven. 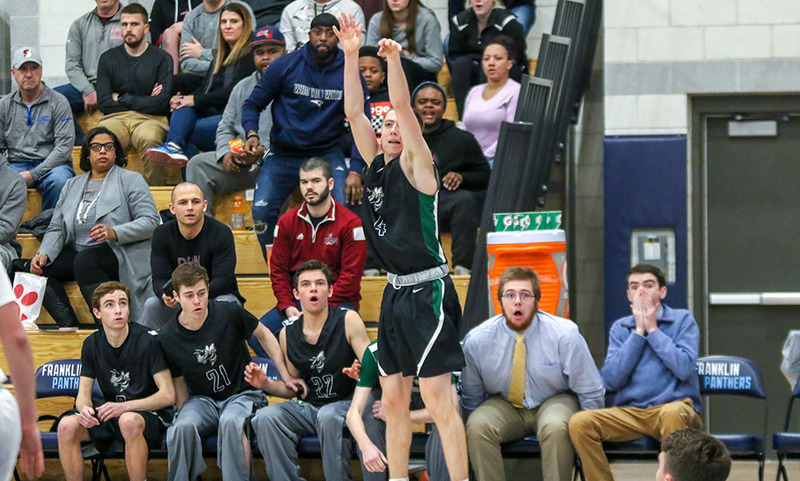 The lead was nine heading to the fourth, but a floater by Gavin Larnard and then a three-point play by Keenan had the Eagles down just four points and the visiting bench fired up. Stevens, who had been quiet for most of the game, sprung into action and drilled back-to-back threes to extend the advantage back to 10. Larnard came right back with a three of his own, but Scott got an open look at a jumper off a Guy feed. A pair of free throws and a layup for Loughnane, off a steal by Korey Reynolds, got the Eagles to within five at 53-48. The home crowd was starting to get a little antsy. Dooling drained a pull-up jumper to calm the nerves temporarily, but Keenan hit a turn-around baby hook from the left block and then Reynolds got free on the left wing for a clean look at a three and with only 34.8 remaining Mansfield got the ball over half and called timeout. BC High elected to play the defensive possession out rather than foul and Dooling managed to get into the lane as the shot clock was winding down, drew the defense, and laid off a pass to Guy, who was able to get the ball up over the rim for the basket that sealed the win. Mansfield (19-4) will host 10th seed Xaverian, which beat Needham, in the D1 South quarterfinal on Friday night. FRANKLIN, Mass. – When Franklin junior Jack Rudolph drained an open three with just under three and a half minutes left in the game to put his team up by eight, it looked like the Panthers were on their way to evening the season series with rival Mansfield. It’s Mansfield’s first season sweep of their rivals since 2014 when the Hornets won inside the field house and at the TD Garden. Rudolph’s six triple of the game gave him a career-high 21 points and the Panthers a 60-52 lead. Franklin’s defense had prevented Mansfield from big runs for the majority of the game and the Panthers looked to be in a good position. Dooling (19 points) earned a trip to the line and sank two free throws, an immediate and needed response to Rudolph’s three for the Hornets. After a stop on the defensive end, Dooling was fouled while shooting a three, and the senior sank all three attempts to make it a one-possession game with 2:37 to go. Another stop for Mansfield and again, Dooling drove to the basket and drew contact. His two free throws got the Hornets within one with 2:03 to go. Jalen Samuels (15 points, seven rebounds) sank a pair from the line on the other end to extend the hosts’ lead to three, but Mansfield sophomore Matty Boen (eight points, five rebounds) drained an open triple to tie the game with 1:38 to go. Franklin’s Will Harvey (two free throws) and Mansfield’s TJ Guy (13 points, six rebounds) traded baskets inside the final minute, Franklin missed a late three and Mansfield had a turnover on its final possession to force overtime. Free throws from Chris Edgehill (11 points, 10 assists) and Samuels put Franklin in front, but Boen sank his second triple of the game to go up 69-67. A free throw from Makhi Baskin extended it to three, but Edgehill responded with a three to tie the game with just over two minutes left in overtime. Samuels put Franklin back ahead with a pair from the line but Sam Stevens (nine points) answered after a terrific feed from Baskin. Franklin had the chance for the last shot but was whistled for an off ball offensive foul. Dooling was fouled before Mansfield could inbound it out of their timeout at midcourt, and the senior went to the line with 5.1 left. After missing the first, Dooling sank the second and Franklin’s last second three was just off the mark. Mansfield went 14-for-19 from the free throw line between the fourth quarter and overtime. “I think early we were playing passive and kind of on our heels, and everything was contested,” Vaughan said. “In the fourth, I felt like Tommy did a really nice job asserting himself into the game and did some good things. Ultimately he had the opportunities and made them. After going up by eight, Franklin went 1-for-7 from the field and 9-for-11 from the free throw line over the final 3:25 of the fourth and all of overtime. “Disappointing,” said Franklin coach CJ Neely on how he would describe how the game ended. “It was a great game. I told the guys we can be frustrated about whatever we want to be frustrated about but I didn’t think we kept guys in front defensively down the stretch without fouling, put them on the line and let them hang around in a game I thought we should have won. Franklin raced out to an 8-1 lead to start the game and lead 16-11 after one quarter. Rudolph hit three three-pointers in the opening frame to give the Panthers the lead. Both Samuels and Mansfield’s Damani Scott (eight points) picked up two early fouls and missed the majority of the first half. A three-pointer from Jake Macchi just over a minute into the second quarter gave Franklin a 21-13 lead but Mansfield tightened up defensively and made a run to get back into it. Baskin hit two free throws and Stevens had an easy layup after a steal from Boen. Baskin then had a steal of his own, leading to another layup for Stevens. The teams traded baskets for the remainder of the first half, with Mansfield going up 33-31 on a triple from Dooling (assisted by Boen) but Franklin answered just before the buzzer when Edgehill found Macchi for a three and a 34-33 halftime edge. In the third, Rudolph his made a pair of threes within a minute and then turned a steal into a traditional three-point play, putting the Panthers ahead 43-38 with just under five left in the third. Franklin’s six-point lead shrunk to just one but Samuels came up with a monster two-handed slam while being fouled to put the Panthers ahead 50-46. Two late technical free throws from Edgehill and a big block from Samuels at the buzzer had Franklin up 52-47 heading into the fourth. “We were trading baskets, then they’d go on a little run and we didn’t counter it for a while,” Vaughan said. “It was just this grind it out, slow game that we just couldn’t get our hands on. The first game, I felt like we had control of it but this one the control was constantly slipping out of our hands. We did just enough. We shot the ball well enough from the foul line, we were atrocious there on Friday night. Making free throws down the stretch, Tommy at the line and I thought the three in the corner was big. Mansfield boys basketball (11-2 Hockomock, 15-2 overall) is on the road against Oliver Ames while Franklin (9-4, 11-5) visits Taunton, both games on Friday.